Howard Steele is a skilled web designer with over 10 years of experience in online marketing and website development. He is the founder and chief editor of https://superbwebsitebuilders.com - the blog, where he writes and publishes informative articles on web design and reviews of website builders to share his knowledge with users. Establishing web presence is a must for any business that has long-lasting goals and perspectives. With such an amazing variety of companies specializing in the same niches, beating the competitors becomes even more complicated than it has been a couple of years ago. Thus, it is close to impossible to withstand niche competition without a quality website that will present your business on the web, attracting user attention and highlighting its benefits. Suppose, you have realize that having a website is a must for your business. What’s next? What should you do to get the one? Fortunately, the ways to launch a website are numerous. The choice basically depends upon the intentions, skills and budget you are ready to invest into the endeavour. If you have enough funds to hire a web designer or even a team of developers, you are welcome to do that. Mind, however, that you won’t have full control over the web design process and the result. If you have got used to keeping everything under control, then using website builders will be a more reasonable solution. This is especially true, if you wish to launch an eCommerce website, which requires deeper understanding of the subject and related nuances. Website builders are full-featured services, which come with a broad range of tools, options and functions needed to create a business website. They are easy to master and they don’t imply the awareness of web design aspects. You just sign up with the platform, select the template that meets your needs and start customizing it, following the tips the service generates. This doesn’t generally take much time, but guarantees great result. Let’s review the most convenient, simple and affordable website builders you can use to design small business websites. SITE123 is a WYSIWYG website builder which rightfully deserves to be included into the list of the easiest the most effective platforms. This is a universal web building solution for all types of projects. Business websites are not an. ensures aquick, simple and intuitive web building process. Due to this, it can be chosen both by inexperienced business owners as well as by proficient website developers. Everyone will find the required features here. 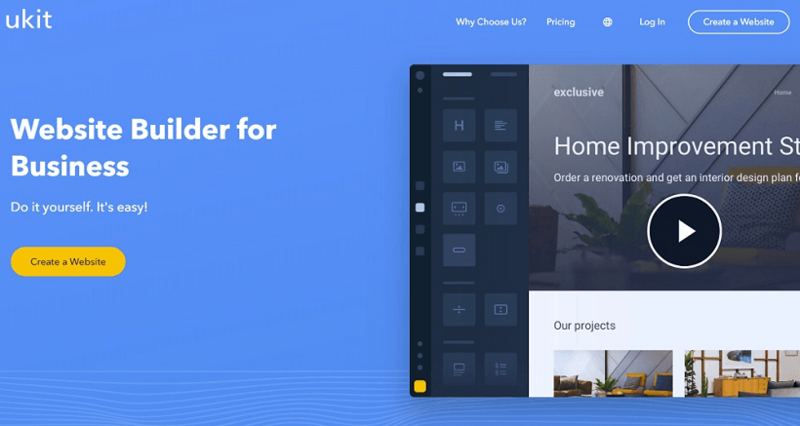 The feature set of this website builder is powerful and rich. It is geared towards a smooth and flexible web building process. The service comes with an intuitive website editor, which eliminates the need to learn coding or practice your web design skills elsewhere prior to using the system. SITE123 boasts one of the best collections of fully responsive templates, which are categorized into thematic sections and look great on all mobile devices. To customize the selected theme, you are offered a set of advanced design editing tools, such as social network and widget integration, selection of fonts, background and website style, web page editing, management of web page elements and more. The service also offers free reliable hosting, advanced SEO tools for better search engine ranking of your website, and free domain registration to boost your brand visibility. The multilingual tool is another great featureof this website builder. It lets you create as many language versions of your website as needed.. This contributes to building relationships with partners from abroad, enriching your client base (it won’t be limited by local users only), and boosting your business popularity. SITE123 is also known for its top notch eCommerce engine. It will help you get a web store up and running with no hassle at all. What you can do is create, update and edit product lists, design and preview the show window, issue discount codes, accept different types of payments, configure shipping and tax parameters, etc. Whatever plan you will go with, it will let you create a full-featured business website. The more expensive the plan is – the more options you will have available to you.. All in all, SITE123 is a worthy investment, if your goal is to launch a business website that will pay off. 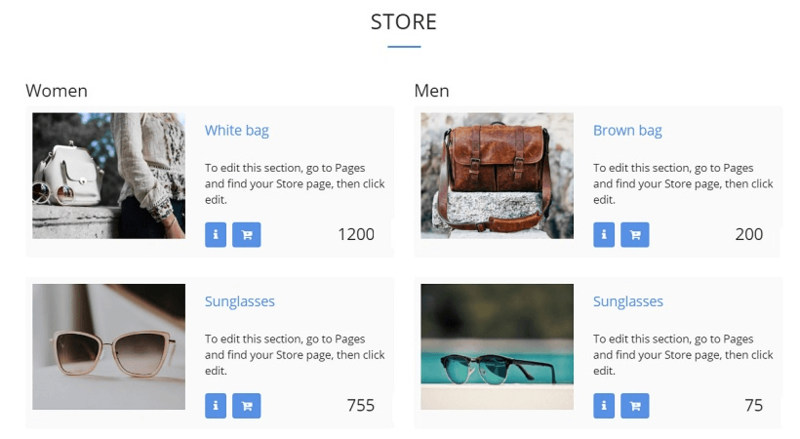 Ucraft is an easy-to-use and functional drag-and-drop website builder, which is a helpful tool for entrepreneurs willing to launch decent websites to showcase their brands. The platform allows getting your business in front of the target audience, presenting your best services/products and keeping your customers loyal and interested in your brand for a long time. With Ucraft, you can launch and manage visually-alluring landing pages, portfolios and business websites. Apart from that, powerful eCommerce engine of the system allows building all-in-one web stores to sell your products online. You can choose between more than 70 payment options, set up shipping and tax parameters, dozens of industry-specific templates, integrate with renowned marketplaces etc. Ucraft also comes with an advanced multilingual tool to make it possible to design multiple website versions in the languages of your choice. The website builder has a rich collection of mobile-optimized templates and a set of designer tools to give them personalized look. Ucraft Articles App lets you create and manage news websites, portals and blogs. What’s more, the website builder has a unique White Label tool for entrepreneurs and web designers, who wish to use its highlights for their own benefit and effective business promotion. The choice of the plan is made with regard to the type of a project you plan to launch, the goals you pursue and the budget you intend to invest. If you wish, you can test any of these plans for free during the 14-day trial period. This will give you the understanding of what subscription works better personally for you. Ucraft provides users with the required set of features and tools needed to design the top notch project from scratch. IM Creator is another popular website builder, which mainly focuses on the development of websites for entrepreneurs. At the same time, the service can also be used for building creative projects and portfolios. The platform is in demand with artists, creative professionals, students and business owners. It features exceptional ease of use and intuitive web building process. This makes it a worthy solution for users, who have coding skills as well as for those, who make their first steps in the web building niche. One of the major highlights of the system is its outstanding eCommerce engine. By using it, you can launch small-to-large online stores and modify its parameters as you need. The website builder also has a nice blogging platform. This is the place, where you can start your own blog, manage it, write and schedule posts as well as communicate with the audience. IM Creator templates are responsive and easy to customize. The system uses the so-called “Polydoms technology”. To form your website layout, you can select the required content Stripes and integrate them into the website. This is easy, quick and engaging. What’s more, the website builder offers the top notch White Label tool to those users, who wish to use the beneficial features of the platform when launching and promoting their web-based businesses. If you are an entrepreneur, you should certainly pay attention to this option. Speaking about the price aspect, IM Creator is initially positioned as a free website builder. And it’s really free for non-commercial organizations, students, artists and all those users, who don’t plan to make profit with the websites, but just wish to present their works or services to the audience. If you need a website builder for business purposes, then you should better upgrade to the Premium Plan, the cost of which constitutes $8/mo. Do you have serious long-lasting intentions? Then White Label Plan from IM Creator might be interesting to you. Explore the terms it offers to make the final decision. Mobirise is the offline web building software. This is what distinguishes the system from other services mentioned in the post. The website builder still has much to offer to its users, who value it for the ease of use, immersive web design experience and multiple top of the line features that contribute to perfect result. Before you actually proceed to the process of website creation, do not forget to download and install the program. Mobirise practices unusual approach to the web building process. You won’t find standard templates here. Instead, the website structure is formed out of content blocks, the overall number of which has exceeded 800 elements. Whether you need to add a header, a footer, a Google map, an article, a photo gallery or any other element, you will find the corresponding content block here. To customize the design of the selected blocks, the platform offers advanced editing tools, such as background and style choice, social media integration options, marketing tools and what not. The undeniable advantage of the website builder is its AMP feature. It helps design web pages, which are optimized for mobile browsing on different devices and rank high in the search engines. Mobirise pricing policy is also impressive. The website builder is free for all users with no exception at all. It doesn’t have any trials, paid subscriptions and web design limitations. You just design a website, making use of multiple advantages of the service. To host your project, however, you will need to get a domain name and hosting provider. Mind that the system offers and opportunity to host your project (or many of them) with GitHub at no cost at all. This is also one of its benefits. Apart from that, you can buy premium extensions and themes to extend your website functionality. Premium templates come at different prices, which range from $19 and up to $39 per a theme. The service also offers an all-in-one universal premium kit, which comprises all the templates and widgets at reduced cost. This is a nice choice, if you plan to use the system for a long time, designing multiple projects. When it comes to the best small business website builders, uKit should be one of the services to think about. This is because the feature set of the platform is initially geared towards the development of websites for entrepreneurs. It is also stunningly simple, convenient and affordable. This is exactly what appeals to web design pros and newbies, who value their time, effort and money above all. The website builder has one of the most impressive and versatile collections of templates. They are responsive and adapt well to all types of mobile devices irrespective of their characteristics. Due to the abundance of customization tools, editing the themes is also quick, simple and engaging. uKit offers a decent choice of business-oriented widgets, which should be integrated into a website to give it specific features for better business performance. If you own an eCommerce website, integrating uCalc will be an undeniable advantage. It will help your potential customers calculate the cost of the services/products they are interested in before they make it a deal. By the way, uKit offers two ways to build an eCommerce website. You can select and integrate the eCommerce widget to further customize it as you need. Another option is to connect the Ecwid plugin to your uKit account and start designing a web store with it. If you don’t have the one yet, you can create and connect it afterwards. What’s more, the website builder offers free SSL Certificate encryption. This feature adds to your business website performance and protection of your confidential data. If you don’t plan to launch a web store, you can select a Premium, Premium+ or a Pro Plan. In case your goal is online store development, it makes sense to go for the eCommerce Plan. Whatever intenions you have, uKit will provide you with the required set of features and tools. It goes without saying that launching a small business website takes time and effort, but this doesn’t have to be a complicated process for a newbie. Website builders unveil multiple options and benefits to those users, who lack web design experience, but have an intention to launch a business or an ecommerce website from scratch. These services are a universal solution for this user category. They are simple and ensure intuitive web creation process devoid of the unnecessary hassle and concerns. SITE123, Ucraft, IMCreator, Mobirise and uKit are the most decent samples of platforms you can explore and use to get the website of your own. Each of these systems has its pros, cons and specific features. Take your time to test them to select the website builder that won’t let you down.